Phew, that’s hard to remember… my brother is seven years older than me and he already had a good collection of LEGO. I can definitely recall playing with the already iconic black convertible (6627). My first set? The 1981 Ambulance and helicopter maybe. The yellowed side panels are still in one of the boxes. Although I never ever had one of these, the Model Team sets were dreams of my childhood as they were really huge and perfectly detailed. Other than that? Well, certainly the Ferrari Racers line as it incited me to modify those sets and make up my own models. They also offered a good amount and variety of pieces. 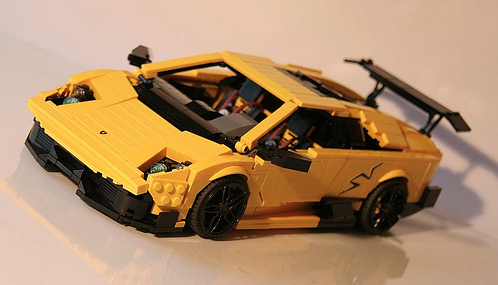 After Lego stopped the Ferrari & Lamborghini themes the Creator sets are pretty cool to increase your brick stock… and Bricklink does the rest (haha). That’s a really tough question as there are sooo many around. I love the incredible part usage of Michael Jasper’s (www.flickr.com/photos/mijasper/) tiny scenes as well as the medieval scenes of Sir Mark of Falworth (www.flickr.com/photos/mark-of-falworth/) or Luke Watkins (www.mocpages.com/home.php/21694) for example and just to name two. Regarding cars, espescially mid-scaled ones, I would always say ‘Mr. Porsche’ Malte Dorowski (www.mocpages.com/home.php/36105). His building techniques always blow my mind and the paint schemes he conjures forth are simply ‘ravishingly beautiful’. Anyway, there are many more car nut builders I couldn’t name as I would certainly forget either one or the other. But two names have to be mentioned: first it’s Ryan Link (www.mocpages.com/home.php/17741), who also focusses on Ferraris – and every time I wonder how he managed to build cars that I thought were ‘unbuildable’ (haha). And last but not least: Firas Abu-Jaber (www.mocpages.com/home.php/12960) His Lamborghinis are already icons – as well as his other cars. I guess he still is the most influetial builder in this genre although he hasn’t posted anything for a long time. Let’s hope he will return from that dark age one day. Oh, that’s even harder than the question before so I will only consider my own creations (*blink*). When I finish a model I always have the feeling that THIS is the best… so I would say my 599XX Evo or the old F1-redux. My 575 GTC was (yes, it is no more) was a very hard build and I still like my Octan-themed Le Mans Prototypes. But, as I already mentioned, the last model always seems to be the best, so stay tuned for my newest addition. As in real life I really love cheese! But the whole variety of curved slopes comes handy, too! Collecting photos…. LOTS of photos. And, if possible, blueprints. However, to build exactly to scale is a lesser concern for me than including the recognizable design elements and lines of the real car. I also use LDD to develop assemblies and whole models. With Malte Dorowski’s models in mind I would say I’m a traditional builder. Most of the bricks in my models face upwards, SNOT is used where needed. Over the years I paid more and more attention on ‘studlessness’ as I think it looks much better on racing and sports cars. The interior and the engine are just as important to me as the covering – I love to include every single detail without building stuff and greebles that aren’t present on the real car. Will be a talent… hmm, I think all of them already demonstrated their abilities: Senator Chinchilla (it still puzzles me how fast he creates two or three models in a week or so), the Bing-BongBrothers, AadenH, the LegoBuilders and Starscream Soundwave (that F50! )… again, just to name a few. Regarding the huge mass of AFOLs there will apparently be lots of kids growing up playing Lego. And as long as there are kids with fantasy we will see many talented builders without any doubt. I already announced a new MOC above. It will be the Ferrari 458 GT3 racer. Actually I made two of them, one in red, one with a striking paint job I think. The red one will be equipped with Power Function remote control… one day in the remote future I fear as I momentarily have really limited time for Lego. Sven also suffers a creative crisis… I hope I will find some time to take a few photos of the 458 GT3 soon. A long time dream is to build a modern RC racing transporter… maybe one day. Great interview! I’d just like to say that Sven’s & Jens’ creations are what got me interested in building large scale LEGO cars. The teaser pic is really promising! Thanks for stopping by. We wonder, are you related to ‘The LegoBuilders’ in Jens’ ‘Builders of the Future list’ in the interview above?! I’m not 100% sure, but that name is the username we use for our MOCpages and Flickr accounts, so I’m guessing he’s referring to us.